Will this be the design of Royal Mail's 2016 60th Anniversary Europa Stamp? With the United Kingdom's 'Toys' Europa stamp issue for 2015 still to be revealed - although look at the gap in the calendar in October - PostEurop has revealed the common design chosen for 2016. And this may be the first common design that Royal Mail has followed since 1984. 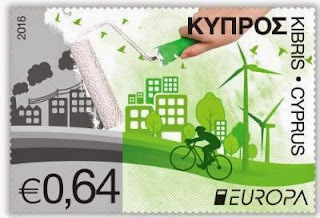 PostEurop is proud to announce Cyprus Post as the winner of the “Think Green” joint design competition. The design from Cyprus Post artist, Ms Doxia Sergidou, was chosen amongst 24 outstanding entries. Posta Slovenije and Magyar Posta followed in second and third place respectively. A total of 24 designs were submitted based on the chosen theme, to compete for the honour of having their image on the 2016 EUROPA stamps. Up to 216 confidential votes were received from 36 PostEurop members whose designs were anonymously published. “The left side of the stamp represents the polluted side and is painted grey showing us the tremendous disaster caused by the industries, automotive vehicles, power generation and inefficient waste. It also shows how the human activities are negatively influencing the environment. In contrast on the right side of the stamp, is the green side which shows us how using renewable energy resources, acting in a more environmental way and becoming more environmentally aware could positively affect the environment. This will not only have a positive effect in our generation, but it will also help the future ones to co-exist in harmony” adds Ms Sergidou. “The impact of our activities on the Environment is an area of high priority for European postal operators and the multitude of initiatives across Europe inspired the theme linked to Europe’s ecology - Think Green. Once again the designers pulled through taking on this challenging theme and produced some magnificent entries. A lot of thoughts have gone into the designs and we would like this special 60th issue of EUROPA stamp to help build a legacy for the future generations” exclaimed Anita Häggblom, Chair of the PostEurop Stamps and Philately working group from Ǻland Post. “In the last 60 years, Europe has gone through a tremendous change but the initial concept still remains. We are happy with the outcome of this design competition and would like to thank all 24 entrants for taking the time to articulate in a special design what is quite complex in today’s world.” concludes Mr Botond Szebeny, PostEurop Secretary General. The Europa theme in 2017 will be Castles and in 2018, Bridges.... which makes Royal Mail's choice for March this year slightly unfortunate. Doubtless they will restrict their Europa issue to one stamp to avoid further collector criticism that "bridges are being overdone". "I tweeted on the 20th asking RM stamps about the Europa toys issue - had a direct message reply - RM are not participating this year." So no Europa stamp this year, and from what I was told last week, "there's no way we would go with that design from Cyprus even if it is the common design for the 60 years". Well, if Royal Mail stop producing Europa stamps that will benefit Europa collectors who normally have to buy a complete set/block for one stamp, or pay a high price to get a set split. Presumably the choice of 2018 theme is ironic given the referendum to be held in the UK in 2017 and if there is a vote to withdraw, the bridge(s) depicted on the Royal Mail issue will be old and broken. Plenty of Castles and Bridges to choose from, although some have appeared on stamps quite recently. Another reason why the October issue has not been finalised could be because the Rugby World Cup takes place in England this year from 18 Sept to 31st October. How well England fare may be the reason for delay. Subbuteo ? Just had a look at Wikipedia for that. Mentions both codes of rugby, and also was manufactured in England. But we already have a Rugby World Cup set scheduled; I doubt they would duplicate that. And if England win, it will be a miniature sheet as before, not a Europa issue I think. I think the reason it's not been announced could be because it's something highly commercially orientated, along the lines of the Dr Who issue. Thinking of Toys, perhaps Lego? I wouldn't put it past Royal Mail to do this, Jersey Post have recently done it with Hornby. Also there is going to be a new Star Wars film towards the end of the year which is deep filled pie of opportunity that everyone would like to have their finger in. Here's a link http://www.posteurop.org/europa2015 - PostEurop is proud to present the 2015 EUROPA stamps entries for the theme “Old toys”. Till 31 August 2015, you can vote for your favourite. If you compare the stamps shown, with the list of members, Royal Mail is in the august company of Albania, Armenia, Kazakhstan and Macedonia in not so far providing a Europa stamp for the 2015 vote. And we know what is in the Royal Mail programme until the end of August. Interestingly a number of countries have issued stamps but they are not shown as separate members - Gibraltar, Faeroes, Greenland for example. AS RM seem to be attending quite a few European exhibitions this year, maybe put the Europa design on an exhibition only Post & Go stamp for next years exhibitions. It would add a bit of variety from the usual Machin/Union Flag on offer. I was tempted not to let this comment through in case anybody from Royal Mail read it ! It's a novel idea but a lot of collectors would not be happy with it. With a pending European referendum in 2016 or 2017 perhaps Royal Mail feels it needs to hold back on European-themed issues so that it can not be accused of backing the pro-Europe side rather like it failed to commemorate the anniversary of the Battle of Bannockburn at the time of the Scottish referendum.